Go! Towels - Buy these incredible travel towels right now! Go! Towels are perfect for any occasion! Go! Towels are perfect for any occasion! 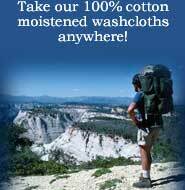 Take them Camping, Hiking, Fishing, to the Gym, Hunting, Golf, Running, Cycling, Climbing, Travel, Picnics, BBQ's, Soccer Moms and more! For added refreshment serve steamy hot (heat in a microwave or boil in water) or icy cold (chill in the refrigerator or cooler). We are so excited about these towels we are offering Free Shipping on any purchase! note: Go! Towels are no longer available in re-sealable 4-packs. They are now sold as single use individually wrapped towels! Go! 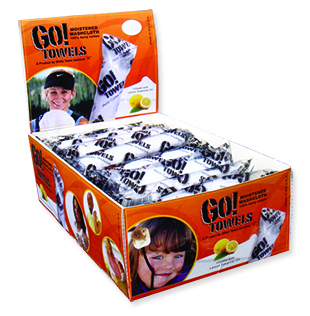 Towel POP - 48 ct.
A Point-of-Purchase box of 48, individual wrapped, Go! Towels.